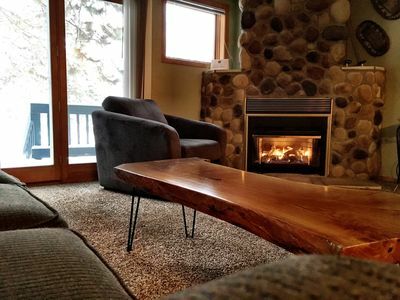 Come up north with your family to the scenic Minnesota woodlands and enjoy 'Iron Ridge', our private log home, beach, and dock on the peaceful shores of Wynne Lake. 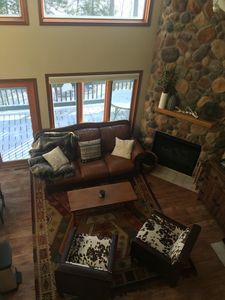 Easy to find and most convenient of the vacation rental homes, we are on the same side of the lake and just one mile down the road from Giants Ridge Ski Resort and the renown Quarry and Legends Golf Courses. 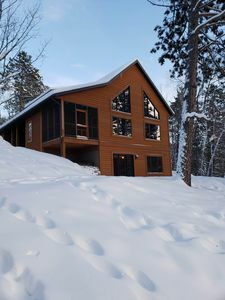 'Iron Ridge' is a custom home built with massive red pine logs and situated on a spacious wooded lot with private lakeshore and dock. A large secure garage and extensive paved driveway provide plenty of safe, off-road parking for all types of vehicles, trailers or campers. The main level features a well equipped kitchen with everything you'll need (dishwasher, microwave, crock-pot, blender, etc). 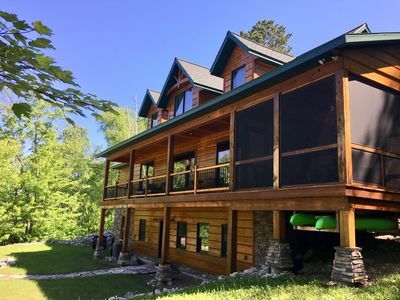 The dining area (with large table and center island), living room with fieldstone fireplace), and wrap-around covered deck all provide gorgeous views of the lake. Both main level bedrooms boast comfortable King size beds, and the main bathroom has a shower and jacuzzi (jetted) tub. The living room sofa pulls out to a queen sleeper. The lower level is the perfect place for entertaining and family fun. It features a wet bar/kitchen area with sink, refrigerator, large counter/bar with stools and 2 pub tables. 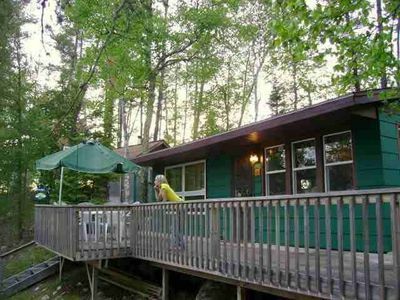 From here, walk out to the patio area which overlooks and is only steps from the lake. The patio highlights a large outdoor Hot Tub, patio furniture for dining, sunning or lounging, gas grill, and log porch swing. Step back inside and just down the hallway you'll find a full bathroom complete with a shower, changing room and cedar sauna. Also down this hallway is a utility room with washer, dryer, and iron. Both downstairs bedrooms are equipped with bunk beds: one with 2 full beds (full over full bunk), and one with 4 twin beds ( 2 twin over twin bunks). 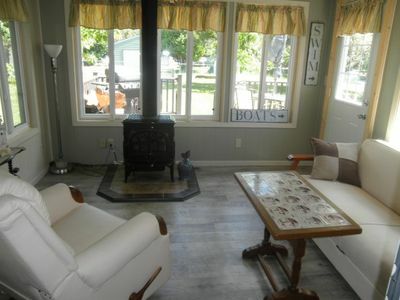 The lower level family room is great for relaxing. 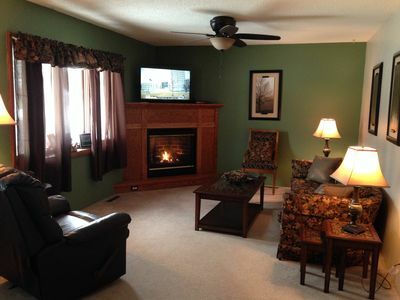 Along with a second fireplace, this room has a large TV complete with Sat/Dish TV, XBox 360, and DVD/VCR player. You'll also find books for all ages, board games, XBox games, and an extensive DVD collection. The Queen sofa sleeper and futon provide additional sleep accommodations. 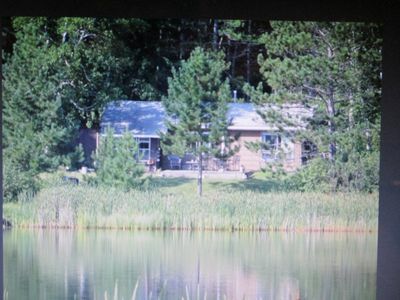 Island Retreat On Bear Island Lake, Family And Pet Friendly. 10 Minutes To Town. Your getaway next to all the Giants Ridge Resort activities! 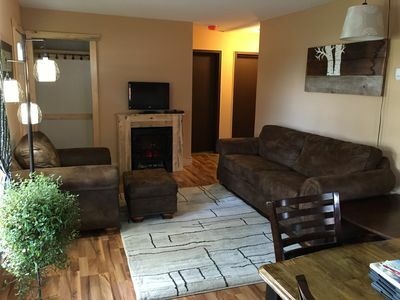 Quiet, cozy 2 bedroom escape!!! 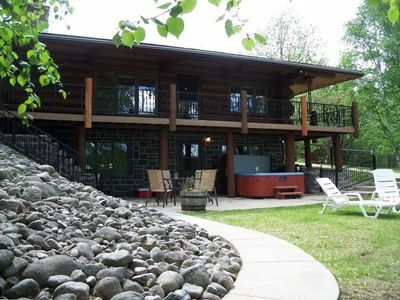 Stunning Modern Log Cabin, Family Friendly, Hike/Bike/Golf/Ski/Fish/Canoe/Kayak!